Whether operating as a shallow well or deep well pump, count on F&W's versatile, powerful jet pumps to deliver more water at full city pressures! These pumps provide higher single stage capacities and pressures; depths to 150 feet, capacities to 1800 GPH and as much as 90 pound pressures. 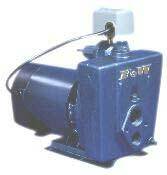 The CPJ pumps feature the famous Flint & Walling "Service Plus" motor. Available in either NEMA J or Uni-frame flange construction. F&W's 56 frame, double ball bearing motors offer the ultimate in performance and dependablility. Designed for years of trouble-free operation and simple, swift on-site servicing, the CPJ pumps feature unique interchangeability of replacement parts to keep inventories at a minimum. Flint & Walling, 95 N Oak Street, Kendallville, IN 46755. Tel: 219-347-1600; Fax: 219-347-0909.